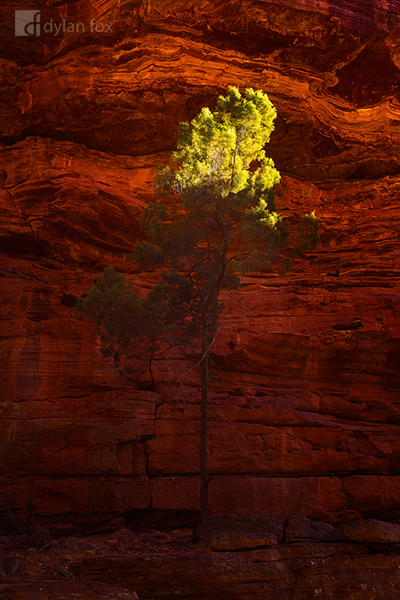 I had photographed this tree in Kalbarri National Park on a visit earlier in the year. The sun however was not lined like it was on this trip in late spring. Not long after sunrise I made my way down into one of the spectacular gorges in the park and this tree was putting on a show. The morning light was just catching the top of the tree as it leaked into this narrow section. The warm light was stunning however shooting it took a bit of waiting for any slight breeze to fade to ensure the tree was sharp. Secure your limited edition, Kalbarri photographic print, 'Gracious', by selecting your desired print size in the menu to the right.